SATTAHIP, Thailand – Senior navy leaders from the U.S. 7th Fleet and Royal Thai Navy met for a professional exchange of ideas in a variety of technical and operational topics aboard the 7th Fleet flagship USS Blue Ridge (LCC 19), May 12. The two navies maintain a strong alliance through numerous joint exercises and Fleet engagements as well as periodic meetings of senior Staff members known as "staff talks." Staff talks involve professional dialogue between the two allied staffs and allow leaders to discuss goals for future collaboration and common concerns and challenges the two forces share. Thailand is the America's oldest ally in Asia. The alliance began more than one hundred-eighty years ago with the signing of amity and commerce treaty between the relatively young United States and the Kingdom of Siam in 1833. One place where you see that strong partnership reflected is in their navy-to-navy relationship. The U.S. Seventh Fleet has relationships with many navies around the region. Some are friendships, some are partnerships, but only a select few are alliances. The U.S. and Thailand are treaty allies - the strongest and most enduring commitment that two nations can make. "Thailand is one of our five treaty allies in the region and has been a staunch ally for many, many years," said U.S. Navy Capt. Anthony Cowden, Seventh Fleet Theater Security Cooperation (TSC) officer. "The Thai Navy has a very important leadership role in the region and that is why it is very significant to support their efforts in the area and see how we can continue to work together. The intent of the staff talks is to increase Theater Security Cooperation through the facilitation of bilateral and multilateral military exchanges and dialogue. It provides a meeting place for partnered navies' subject matter experts to meet and discuss different aspects of their mission objectives and their responsibilities. "This was a very good opportunity that we were able to come together for our friendship," said Royal Thai Navy Lt. Cmdr. Samart Yangyoo. "This was my first time here and everyone was very warm and friendly." 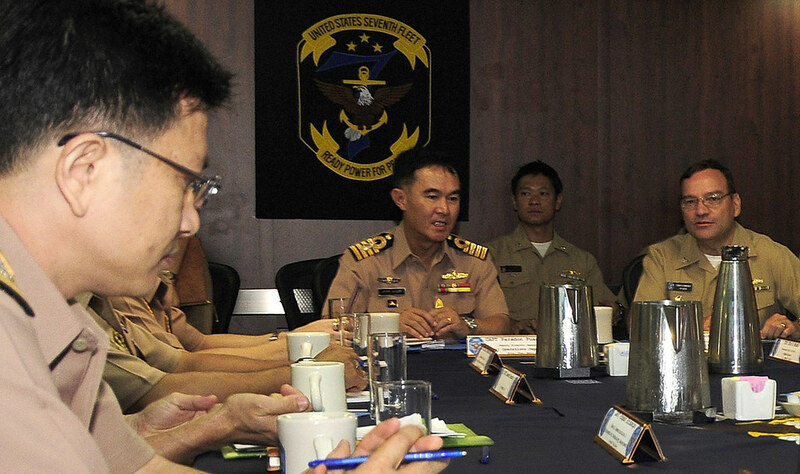 "This was a much needed and positive engagement between the U.S. and Thai Navy," said U.S. Navy Lt. Reuben Attah, U.S. 7th Fleet Thailand desk officer. "This was our time to foster our relationship with the Thai Navy and grow our abilities to cooperate and work together for upcoming exercises and future events." The U.S. Seventh Fleet and the Royal Thai Navy have a very valuable working relationship that includes exercises such as Cobra Gold, Cooperation Afloat Readiness and Training (CARAT), and Guardian Sea to develop interoperability between the two navies. Blue Ridge and embarked staff are in Thailand for a scheduled port visit during a spring patrol operating forward, building maritime partnerships and conducting security and stability operations.